The Dormition (Falling Asleep) of the Theotokos is one of the Great Feasts of the Orthodox Church, celebrated on August 15. For those churches using the Julian Calendar, this feast falls on August 28 in the secular calendar. 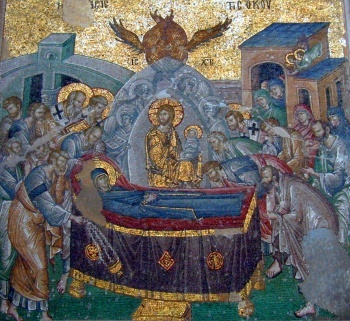 The Feast of the Dormition, which is also sometimes called the Assumption, commemorates the death, resurrection and glorification of Christ's mother. It proclaims that Mary has been "assumed" by God into the heavenly kingdom of Christ in the fullness of her spiritual and bodily existence. According to Orthodox Tradition, Mary died like all humanity, "falling asleep," so to speak, as the name of the feast indicates. She died as all people die, not "voluntarily" as her Son, but by the necessity of her mortal human nature which is indivisibly bound up with the corruption of this world. The feast was added to the Roman calendar in the seventh century as the Dormitio. In the eighth century, the title was changed to the Assumptio (Assumption). The Apostles were miraculously summoned to this event, and all were present except Thomas when Mary passed from this life. She was then buried. Thomas arrived a few days later, and desiring to see her one more time, convinced the others to open her tomb. Upon doing so, the Apostles discovered that her body was no longer present. This event is seen as a firstfruits of the resurrection of the faithful that will occur at the Second Coming of Christ. The event is normally called the Dormition, though there are many Orthodox parishes in English-speaking countries with the name Assumption. In Greek, Dormition is Koimisis—falling asleep in death—from which the word cemetery derives. The feast is preceded by 14 days of strict fasting, with the exceptions that fish is eaten on the Feast of the Transfiguration (August 6). On weekdays before the feast, either the Great Paraklesis (service of supplication) or the Small Paraklesis is celebrated. On the eve of the feast, Vespers is served and contains three Old Testament readings that have New Testament meaning. In Genesis 28:10-17, Jacob's Ladder which unites heaven and earth points to the union of God with men which is realized most fully and perfectly in Mary the bearer of God. "How awesome is this place! This is none other than the house of God, and this is the gate of heaven!" In Ezekiel 43:27-44:4, the vision of the temple with the door to the East perpetually closed and filled with the glory of the Lord, symbolizes Mary. And in Proverbs 9:1-11, Mary is also identified with the "house" which the Divine Wisdom has built for herself. Sometimes Matins is served on the morning of the feast. The Gospel reading is from Luke 1:39-49, 56. It is read on all feasts of the Theotokos and includes the Theotokos' saying: "My soul magnifies the Lord and my spirit rejoices in God my Saviour, for he has regarded the low estate of his handmaiden, for behold, henceforth all generations will call me blessed." Divine Liturgy is served on the day on the feast. In some churches, it is the custom to bless flowers on this feast before the Liturgy. The epistle reading is from Philippians 2:5-11, and speaks of "Christ Jesus, who, being in the form of God, did not consider it robbery to be equal with God, but made Himself of no reputation, taking the form of a bondservant, and coming in the likeness of men." The gospel reading is taken from Luke 10:38-42 and 11:27-28 together; this reading is also always read on all feasts of the Theotokos. In it, the Lord says, "blessed are those who hear the word of God and keep it!" She was translated to life by the One who dwelt in her virginal womb. Dance with joy, O peoples! Clap your hands with gladness! Ascending from earth to heaven. We ceaselessly praise her in song as truly Theotokos. "Rejoice, O Virgin, pride of Christians!" The icon of Panagia Ierosolymitissa located inside the Sepulcher of the Theotokos. The Account of St. John the Theologian of the Falling Asleep of the Holy Mother of God. from Ante-Nicene Fathers, Volume 8. This page was last edited on July 31, 2018, at 10:25. This page has been accessed 110,964 times.